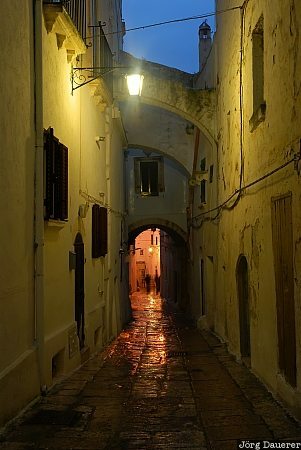 A narrow alley illuminated by a street lamp at night in the "white city" (Citta Bianca) Ostuni, Apulia (Puglia) in the province of Brindisi in southern Italy. This photo was taken in the evening of a rainy day in late April of 2006. This photo was taken with a digital camera.